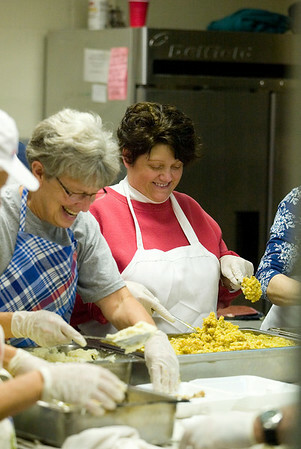 Eileen Wooer (cq), left, and Kerri James (cq) prepare Thanksgiving dinners with other volunteers at Trinity Lutheran Church Thursday morning. Volunteers prepared and delivered about 800 meals to area residents, then prepared another 350 meals to serve at the church. The volunteer effort is in its 22nd year, and is one of several in the Grand Traverse area bringing meals to those in need for the holiday.